Dietary protein provides the chemical building blocks, called amino acids, to manufacture the many different types of proteins your body needs to function. Nonessential amino acids are those your body can produce with its own cellular machinery. In contrast, your body is incapable of producing the essential amino acids; they must be obtained from your diet. Although many animal proteins provide you with the full complement of amino acids, soybeans and quinoa are the only plant-derived foods that contain all nine essential amino acids. Essential amino acids are grouped based on chemical similarity. Lysine, methionine and threonine are members of the aspartate family of essential amino acids, and are found in both immature and mature soybeans. Lysine is incorporated into many important proteins and is particularly important for your bone, muscle and joint health. Methionine is one of only two amino acids that contain sulfur. Your body uses methionine to form the chemical S-adenosyl-L-methionine, better known as SAMe. This chemical participates in many metabolic processes in several organs, including your brain and liver. Threonine has a region that commonly reacts with phosphate molecules. The addition of phosphate to amino acids like threonine is important in activating and deactivating proteins. 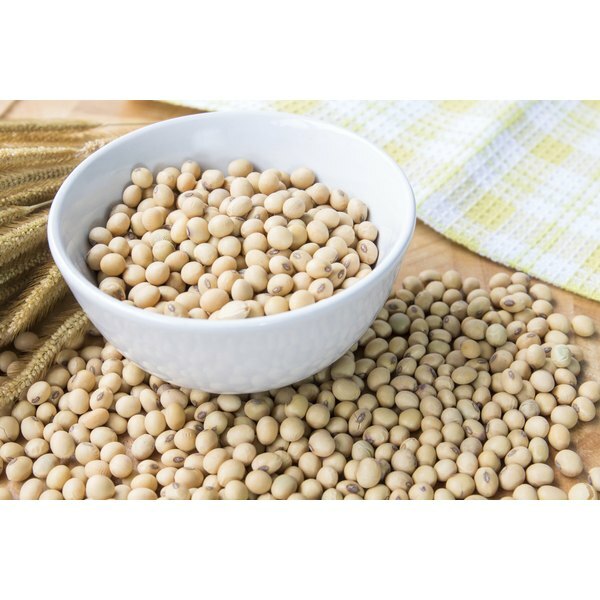 Soybeans, tofu, soy milk and other soy products contain the pyruvate family of essential amino acids, including leucine, isoleucine and valine. Strings of amino acids fold onto one another, giving different proteins specific shapes. Leucine, isoleucine and valine are typically found in the interior of protein molecules, causing them to fold in specific ways and stabilizing their three-dimensional structure. Maintaining a specific shape is critical to the function of the many different types of proteins in your body. The aromatic family of essential amino acids includes phenylalanine and tryptophan. The word "aromatic" does not refer to the odor of these amino acids, but rather, the fact that their chemical structure includes a ring of bonded carbon atoms. One of the many important roles of tryptophan in your body is its incorporation into the neurotransmitter serotonin. Phenylalanine is a component of other important nervous system chemicals, including epinephrine and dopamine. Insufficient amounts of aromatic amino acids in your diet — from soybeans or other protein sources — may slow the rate of production of serotonin, dopamine and epinephrine. Histidine has a unique chemical structure unlike the other essential amino acids. Your body uses histidine to manufacture several important chemicals, including histamine. Histamine is the chemical responsible for many of the symptoms of allergic reactions and performs other functions in your digestive and nervous systems. Why Are the Eight Essential Amino Acids Important?